The piano and organ are two of the most popular keyboard instruments in the world. Both of them are very similar, however, there are some key differences that really set them apart. So, what’re the biggest differences between organ vs piano? Traditional organs rely on air moving through pipes to project musical pitches. Pianos, on the other hand, rely on hammers striking a set of strings and projecting via the soundboard. Pianos also have 88 keys compared to an organ which has 61 keys. Those are just a few of the basic differences between the two instruments. In this article, I’ll dive into those as well as a few more things you want to know about when comparing the organ to the piano. We’ll also discuss a lot of the similarities, playing techniques, and other interesting things to look for. First, let’s start with how each instrument produces sound. The way organs and pianos produce sound is really unique. 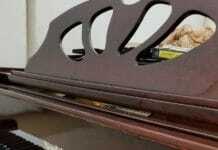 The piano is a string based instrument, so it relies solely on the felt hammers striking the keys above. Here is a detailed guide on how the piano works, but I’ll touch on it briefly here. When a pianist presses a key, the lever in the action mechanism is released. This allows the dampers that are sitting on top of the strings to rise. The hammer then lifts at the precise speed and attack that the key is pressed and strikes the strings. Because the damper is lifted, the string is now able to vibrate, allowing for the pitch to resonate. Organs also use a keyboard to choose the pitch, but the production of sound is much different. In the case of a traditional pipe organ, pressurized air travels through the pipes. This all works thanks to the tracker action; the mechanical link of the keyboard to the pipes. Depending on the age of the organ, the air can travel through lead tubes or through an electrical connection. As the air travels, each key provides a specific level of pressure that is used to push the air through the correct pipe to produce the desired pitch. Reed organs work similarly. They use wind pressure as well, and the sound vibrates against a set of metal reeds to produce the pitch. Organ players also have to use stop knobs to make adjustments to the sound. On electronic organs, the stops are simple tabs to change to specific instruments. For traditional organs, the stops control the amount of pressurized air flowing to the pipes. In the case of vertical pianos and pipe organs, the direction of sound travel is very much the same. The organ is equipped with different sized vertical pipes and each can produce a certain level of sound and texture. When an organist plays, the sound always travels straight into the air. Because of this, churches or recital halls featuring large organs have to carefully design the space so that the sound can better travel. Vertical pianos also have the same issue but have a lot less projection when the lid is closed. In most cases, pianists will open the lid so that as much sound can project to the ceiling and travel throughout the room. Grand pianos work much differently. 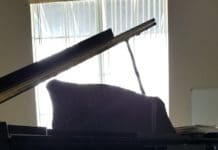 Grand pianos are horizontal pianos and rely on opening the lid so that the sound can travels directly out towards the room instead of straight up. The piano is a much simpler instrument to deal with when it comes to the keyboard. 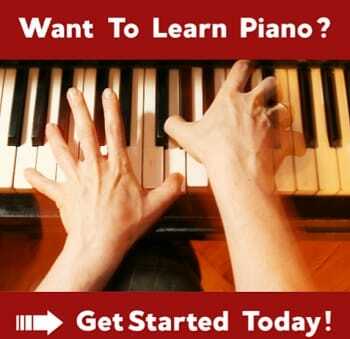 Pianists deal with just one level of 88 keys. When reading through piano sheet music, they simply have to find their pitch based on the grand staff. The piano contains 7 octaves with the centralized pitch being middle C or the fourth C from the bottom. When a pianist wants to change the sound of what they’re playing, they have the option to use the three pedals located directly beneath the keyboard. This includes the una corda, sostenuto, and sustain pedal. When a pianist wants a softer tone, they can simply use the una corda pedal. What this does is shift the action slightly so that the felt hammers only strike one of the strings instead of all three. If a pianist wants to hold onto a chord or passage of notes, they can simply press down the sustain pedal. The sustain pedal keeps all of the dampers lifted so that the strings can continue to vibrate for much longer. Lastly, if a pianist has a desire for one particular note to sustain while the rest remain detached, they will use the middle pedal to lift that specific damper or group of dampers. The pedals work a little differently for upright vs grand pianos. Organists on the other hand deal with two levels of keys called manuals. Each manual has a certain number of keys. It really depends on how many octaves that organ has as well. A five-octave organ will have 61 keys. If it’s a four, three, or two-octave organ, then it will have fewer keys and generally less manual levels. The bottom of the organ also has a set of tone generators called the pedalboard. The pedalboard is designed strictly for the feet to press down and produce pitches out of the pipes. The pedalboard looks a lot like a giant version of the organ keyboard. When reading through organ sheet music, there are many times an additional staff level indicating what notes should be played and when. In general, the piano and organ keyboards look and function the same. The biggest differences are in the size of the keys and the touch response. Organs, for the most part, have a much lighter action and require less touchweight to produce tones. The keys of an organ are also much shorter, and the width of the keys are slightly more narrow than piano. While there are enormous differences between acoustic pianos and traditional pipe organs, there is less of that when it comes to their electric counterparts. Electric organs and keyboards produce their sounds in a similar way. Both are dependent on a loudspeaker or an amplifier of some sort to produce sound. In the case of a Hammond organ, the sound is produced from a large speaker cabinet. The speaker cabinet has a rotating tonewheel, and so the sound is produced using waveforms. 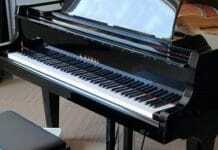 Those sounds can be manipulated using the Leslie, tremolo and vibrato settings on the Hammond. Then there are organs that simply plug into a sound system using a 1/4 inch sound cable as a digital piano would. On electronic organs, there are tons of additional features you won’t find in a regular pipe organ. Things like additional pedals that allow for vibrato effects and actually raising and lowering the volume are very common. There are also tons of sound effects that can be added to simulate other instruments. Many electronic organs are designed to look and feel like pipe organs, however, they produce the sound without using the pipes themselves. The action of those organs is tweaked to allow a realistic touch as if air pressure were being used as well which makes them very likable. Digital pianos like these are very similar to electronic organs. They are built to replicate acoustic pianos, however, there is a lot when it comes to features. Some digital pianos have speakers built into them. Usually, pianists will hook these up to an amplifier to get the best sound, or use headphones. When it comes to sound effects, there are endless possibilities with digital pianos. Many of them come pre-installed with hundreds of choices. With today’s technology, pianists can expand those sound effects by running a USB cable to their laptop to pull additional wave samples. Digital pianos also have ports in them to allow for una corda, sustain, and sostenuto pedaling. A traditional pipe organ is extremely expensive, costing well over $200,000 for an entry-level model. More elaborate pipe organs cost in the millions. A lot of this has to do with the type of metal the pipes are made with, how many stops the organ has, and the overall size of the instrument. Not only are those expensive, but it requires a lot of architectural work to build a pipe organ into a church building. Compare that to an electronic organ that can produce all of the same sounds without all of the hassles for just $2995, a mere fraction of the price. Acoustic pianos also come with substantial costs as well. For example, a brand new Steinway can cost as much as $171,000. However, an entry-level digital piano like would only cost around $200 – $1000. While the digital and electronic counterparts are much cheaper, they are not all created equal. Some digital pianos are better than others. Some electronic organs are better than others. For someone really wanting to replicate what an acoustic instrument can do, they’ll really need to invest in the high-end version of that product. When it comes to a digital piano, spending at least $1500 – $3000 will yield the best quality action that feels like the real thing. Now that you know the main differences between the organ and the piano, you might have a few more questions. Below is a list of some of the common questions that tend to still come up. Can an organ sound like a piano? Certain electronic organs can sound like pianos. Organs like the Hammond B3 have settings that can produce other instruments as well. This includes brass and woodwind instruments. A traditional pipe or reed organ will not sound like a piano. Can a piano player play the organ? Yes, however piano playing is less complex than organ playing. Organists have to also pedal notes with their feet. Organ players also have to adjust the stops and develop a specific touch for certain repertoire.